Ability Cute Charm: The opponent has a 30% chance of being induced with Attract when using an attack, that requires physical contact, against this Pokémon. "Sylveon is a quadruped, mammalian Pokémon covered primarily in pale cream-colored fur with pinkish feet, ears, and tail. There are two bows on its body, one on its left ear and one around its neck, from which two feelers adorn it. The bows are pale cream with pinkish centers, while the feelers are pale cream with pinkish and blue tips. It sends a soothing aura from these feelers to calm fights, and will also use them to "hold hands" with its Trainer. It has short, slender legs and small paws with three visible toes on each foot. Its eyes are blue with white pupils and no visible sclera. When its mouth is open, two pointed teeth can be seen on its upper jaw. Its furry pinkish tail is slightly curved in a crescent shape. Sylveon uses its ribbons to distract cautious prey before it attacks." Motivation The scariest thing about Alucard is that he no longer has his master or his apprentice to keep him on a leash, leaving him with no motivation beyond seeking his own amusement. Alucard is vicious and cruel, especially in combat. He rarely strikes the killing blow until his foes have been utterly disabled and humiliated. However, unlike his father he is still capable of empathy, as he has been seen crying. Due to his own self perceived immortality and invulnerability as a result of the protovirus, Alucard is exceptionally egotistical, taunting and belittling his foes, and even being so bold as to allow them to injure him without much regard as his healing capabilities are exceptional. 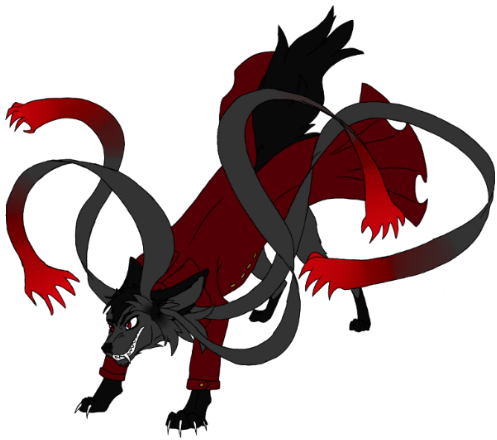 However, Alucard is not beyond being surprised, usually as a result of his own arrogance. Such in his first failure to kill his now deceased rival Alexander Anderson. He also expressed disappointment when Luke Valentine failed to be a worthy adversary and died. Alucard seeks a worthy opponent, an opponent who despite all odds has retained their humanity, and has the willpower necessary to crush him despite his monstrous strength. Despite his outward cruel and arrogant behaviour, Alucard is sad, and envious of those who have managed to retain humanity. He holds a great respect for those who are have the willpower to face old age and death, as he failed to do when faced with his own demise. As well an affinity for those with pride and bravery. While he despises those he perceives to be immortal like himself(Those infected with the proto or zed virus, others who kill wantonly without purpose.) believing them to be pathetic. While he is also capable of affection, there is no longer anyone alive that he has such feelings for, he used to show a great deal of it to his trainer Integra and his apprentice Seras. While he has a disdain for others who are afflicted by the protovirus he is not completely against the immortality it grants and believes it is something one must earn. Presumably he views his own immortality with disdain as his transformation was an escape from suffering. This could be seen in his relationship with Seras as he happily gave her immortality due to the courage and indomitable will she possessed to keep fighting against cruel foes much stronger than herself. Something else important to note about Alucard is his relationship with God. Alucard was raised in a traumatic environment, abused and forced to be a fighter. As a warrior, Alucard believed that words alone could not prove ones faith, rather that actions were the only way to attract the attention of God. It was this belief that drove Alucard to perform many great and terrible deeds in the name of Arceus, but not once did he ask for favours in return. He became famed and feared among the various packs that lived in the wilds of Johto for punishing those he saw as evil, and any who got in his way. It was this warped belief in Arceus; a belief that through enough sacrifice and effort, Arceus himself would intervene on his behalf that caused so many of his pack to fear and abandon him. It was when he failed to utterly destroy his own father, that Alucard realised not only had he failed to eliminate the monster that had kept so many under his paws, but he had become a monster himself. His friends, family, so many had died because of his own anger, and selfishness. He felt in that moment God had abandoned him, so he abandoned God and became a true monster, inside and out. However, much time has passed since then, and his hatred for God has deteriorated, and after much self reflection he realised that it was his own hate against the monster that wronged him that drove his actions. He came to understand that he used the name of God to mask his own anger and lust for power.